Richard Lynch is one of the hardest working musicians in the world and a songwriter veteran of his craft. With a career spanning over three decades, not only is Lynch an ambassador of traditional country music in its purest form but stands as an American phenomenon. He has received numerous awards for his musical endeavors and honored for his work as a humanitarian. After having performed at hundreds of venues and collaborating with some amazing people, not only is Richard Lynch admired for his work ethic but is one of the few legends dedicated to keeping country music alive. Originating from Ohio, Lynch, along with a group of hand selected and exceptional musicians have created a distinct sound for themselves as The Richard Lynch Band. 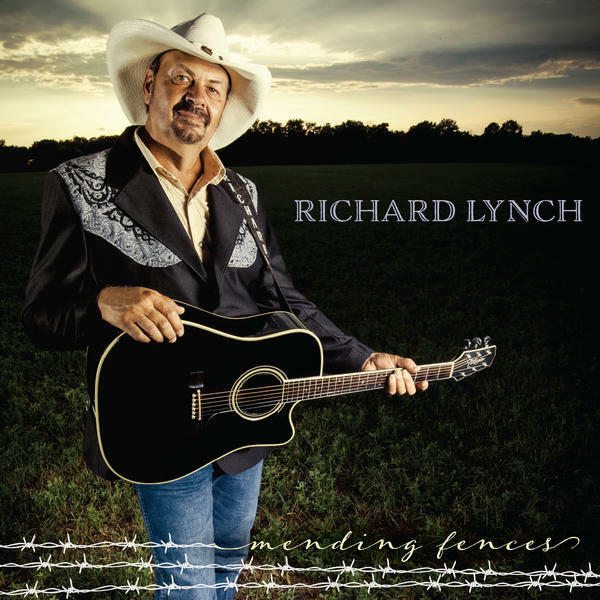 Released on April 1st, 2017, Mending Fences is Richard Lynch’s third studio album. It’s an impressive piece of evidence for anyone interested in exploring the heart and soul that Richard Lynch puts into his music. His latest effort is a fabulous 12-track journey that reads like a diary from country music’s favorite prodigal band. Daddy’s Words is the opening song on the Mending Fences album. It’s a delightful tune with a catchy groove and a practical look at one of life’s greatest lessons, listening to the wisdom of our fathers. Lynch’s melodic voice immediately grabs the listener’s attention. The rhythm guitar on this track is pretty fierce. Easily one of the highlights of the album. The title track of the album proves to be a sparkling gem of a song. Once again, Lynch proves himself to be country music’s foremost poet with an offering of some grown man’s wisdom. His unique comparison of love lessons and the art of fence mending is a superb analogy. In Over My Heart is an excellent display of Lynch’s vocal range. Sort of an upbeat tune with quite an attractive rhythm consisting of clever overlay of instrumentation, this is definitely a listener’s delight. Crazy Man is a break from much of the album’s formula. It’ Lynch’s self-portrait of the changes he’s made in life. Something that we can all relate to. Musically, it’s a bit of a blues tune with a shallow backdrop that allows the listener to focus on the depth of the song’s message. Lynch’s duet with songstress Rhonda Vincent on Back in Love Again is a great song that serves as a breath of fresh air in its hopeful approach. This is followed by the millennial influenced Cut and Paste. It’s a song about the ups and downs of bonding with that significant other in an era where technology makes home-grown communication hard. Other album treasures include the musically brilliant Think and Drive, Things You Shouldn’t Do, and Lynch’s remarkable cover of Knock Three Times. Lynch ends the album with an amazing and speculative track, entitled, Country Music Isn’t Country Anymore. It’s a driving track that reveals a glimpse of what The Richard Lynch Band is working so hard to keep alive. Overall, I must say that Mending Fences is a masterpiece! America is indebted to The Richard Lynch Band for keeping its homeland music alive. I’m giving Mending Fences five out of five stars, a certified classic! Thank you, Richard Lynch! Normally not my first choice of music, but after giving it a try now I must say that I like what I heard so far.